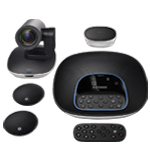 GROUP, the amazingly affordable video conferencing system for mid to large-size conference rooms, allows any meeting place to be a video collaboration space. It’s as simple to use as a mobile phone and affordable as an office chair, now it’s easier than ever to include anyone in the conversation. USB plug-and-play connectivity makes GROUP a breeze to deploy and use. It even works within your own familiar computing environment with any video conferencing software application — including the ones you already use. Razor sharp video and a beautifully designed full-duplex speakerphone deliver an outstanding collaboration experience that’s so awesome everyone can be seen and heard. Simply connect a laptop and start a meeting, or use the state-of-the-art speakerphone with a Bluetooth® wireless technology enabled mobile device for great-sounding audio calls. - GROUP, our video conferencing solution for rooms that seat 14–20 people, delivers high quality HD video and crystal clear audio, allowing any meeting place to be a video collaboration space. With advanced features like acoustic echo cancellation, noise reduction technology, and intuitive controls, it’s easier than ever to include everyone in the conversation. - USB plug-and-play connectivity makes GROUP a breeze to deploy and use. Simply connect GROUP the conference room computer or your laptop through USB, and you’re good to go. Use GROUP with any video conferencing software, including those you already use. For great-sounding audio calls, pair your mobile device with Bluetooth wireless technology to the GROUP speakerphone. - Customize the setup to match the layout and size of your room. Mount the camera on a table, tripod, or wall. Optional expansion mics extend audio coverage up to 28 feet (8.5 meters). Add an optional 33 feet (10 meter) or 49 feet (15 meter) cable to increase the reach of the speakerphone or camera. - Bring meetings into focus with GROUP’s premium lens, 10x lossless zoom, and HD 1080p/30 performance. Perfectly frame presenters and whiteboards with pan/tilt control, and zoom in for detail and clarity. GROUP’s 90° field-of-view provides ideal coverage for medium and large conference rooms, with motorized pan and tilt for wall-to-wall, floor-to-ceiling coverage. - Everyone hears and can be heard with GROUP’s full-duplex speakerphone, which delivers sound that’s crisp, clear, and highly intelligible. Acoustic echo cancellation and noise reduction technology make conversations natural-sounding while reducing reverberation and ambient noise.